Trying to Remember the Color of Jackie Kennedy’s Pillbox Hat (detail), 1994, pastel on paper in one hundred parts, 11 x 10" each. Installation view. Peculiar chandeliers adorn the entrance to Spencer Finch’s midcareer survey at MASS MoCA: incandescent bulbs of alternating size emerge from rods and joints at odd angles. The setting is sparkling yet obscure, and only with time will visitors recognize shapes and forms reminiscent of their high school chemistry classes. This arrangement of 401 bulbs, at first seemingly erratic, is in fact the atomic structure of the pigments Finch used to match the color of the night sky over the Arizona desert. Translating and reshaping source material has become increasingly prevalent as more information moves into digital formats. By aiming to communicate the subjective qualities of color perception, however, Finch guarantees these processes will end in failure. The purpose of a work such as Night Sky (Over the Painted Desert, Arizona, January 11, 2004) then becomes to fail radiantly. The accompanying catalogue notes that the exhibition’s title, “What Time Is It on the Sun?,” is drawn from Ludwig Wittgenstein’s Philosophical Investigations and refers to the limits of understanding that are structured into language. The original passage is in fact a bit more complicated: It sets up an analogy between the impossibility of telling time on the sun and that of understanding the pain of others. This suggests an ethical dimension to Finch’s project, and a fourteen-year survey is a good opportunity to consider its implications. In this respect, two pieces from 1994 stand out: Trying to Remember the Color of Jackie Kennedy’s Pillbox Hat and Blue (Sky over Cape Canaveral, August 31, 1994, 10:25 AM), which depicts the exact patch of sky where the space shuttle Challenger exploded in 1986. 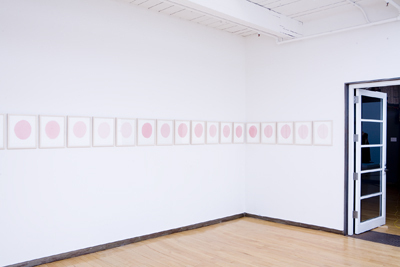 These works poke at the holes in our collective memory and turn color into a substitute for a deeper hue of loss.